The Merino Cemetery is situated on the top of a small hill to the north of the township. The Merino Cemetery Gates were constructed by Thomas BLAKE 1832-1907, carpenter who lived in the town, with 5 of his 12 children being born there from 1863-1872. Thomas BLAKE had married Mary Ann CAPP in London in 1851 and arrived at Portland on the "Constant" in February 1854. The family later moved north of Casterton to the Natimuk area where Thomas died in 1907 and Mary Ann in 1914 and they are both buried in the Noradjuha Cemetery. 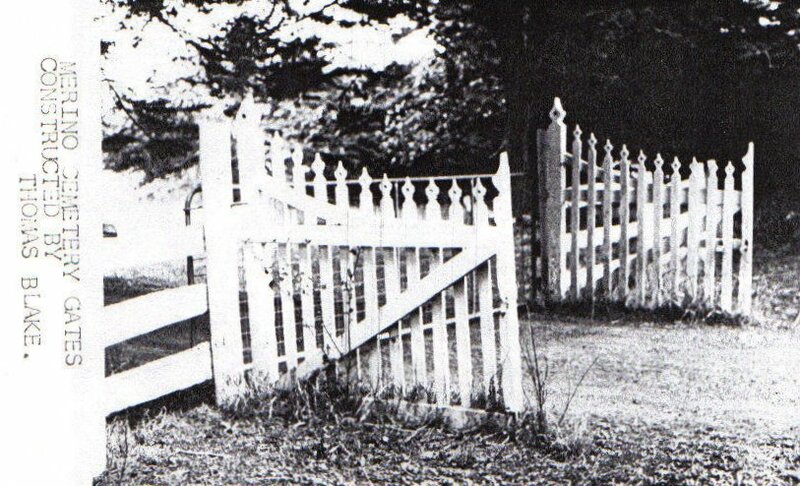 Gwendoline Blake is very interested to know what happened to these gates when removed from the cemetery.